New business cards are on the way. They are very simple; just my name, email, and website. I should be getting them in few days, so I will post pics. This week has been crazy…. 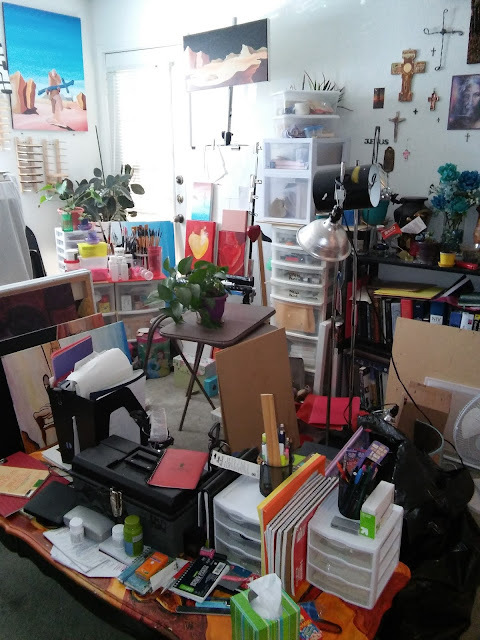 I am reorganizing my studio space once again and living in an art disaster zone. This time around I’m purposefully going a little more slowly and methodically. Since I have tweaked things 2 other times this year, I thought it would be best to map out the area to find the best/efficient work flow setup before moving things around. I also got a large storage cabinet that didn’t come with all of the stuff in the box, so getting that put together has caused a big delay in getting things completed. Here are a couple of pics of things as they are right now….Art Chaos for sure!